If you are new to astronomy or bewildered by the plethora of information about astronomy on the Internet, then this is a good place to start. While I have had an interest in astronomy for decades, I have not been very active in viewing the night skies over those decades. As such, I consider myself to be a beginner. So, this page is my attempt to help us sort out the information, and give us a direction to go. Notebook – The very first thing to do is to make a notebook. I suggest a 3-ring binder at least 1″ thick and a couple of sets of dividers. I make my own filler paper, because I like a 1/4 in. grid on one side of the page and normal lines on the other side. I found some Microsoft Word templates online. My printer can print of both sides of a page, so I use MS Word for printing. PDF’s do not give me the option to print on both sides. Whatever you choose for paper, I strongly recommend the standard 8.5 by 11 size paper. Stores, like Walmart, typically carry only the smaller 8 by 10 paper, which is often of inferior quality (ink bleed-through etc. ), not to mention being a non-standard size. Paper size becomes very important if you are going to include pages printed on normal printer paper. The 8×10 size of filler paper does fit in very well at all! More important than size though, is what you put in the notebook. At a minimum, you will want to log your viewing experiences. You will want to make some notes about how to do certain things, like calculate the magnification of a particular eyepieces, or how to do a polar alignment. You should also keep a running glossary of terms. Every area of interest has its own vocabulary and science in particular – in this case, Astronomy. In my notebook, I also have a section for keeping notes as I read through astronomy texts. How you divide up your notebook is going to depend upon the topics you are interested in. Motivation – Perhaps one the first things to write in your notebook is your motivation for “doing” astronomy. The science of astronomy is a huge field! What about it draws you to it? For me it hits on two levels. The first level is more philosophical – every time I look at the night sky, I am in awe of what is really going on up there. The vastness of space is incomprehensible. We toss astronomical quantities around like we are talking about some quantity of marbles or something, but the distances and sizes of objects are immense! More importantly, the Universe in dynamic. Stars are being born and stars are dying. Galaxies are spinning and some are colliding. Everything is in some kind of incredible motion. So just standing there, looking up at a starry night, always gets to me. Saying that it is incredible cannot come close to defining the feeling. The second level is the science of astronomy. To me, it is almost the perfect science, because we are dealing with the original article and not some lab specimen. Astronomy has physics on just about every level, and the language of the Universe is mathematics (I think somebody famous said that). It has chemistry. And ultimately, it is the unknown and begs for exploration. If that is not enough to getcha, then how about the sheer beauty of it? That alone is worth the effort. 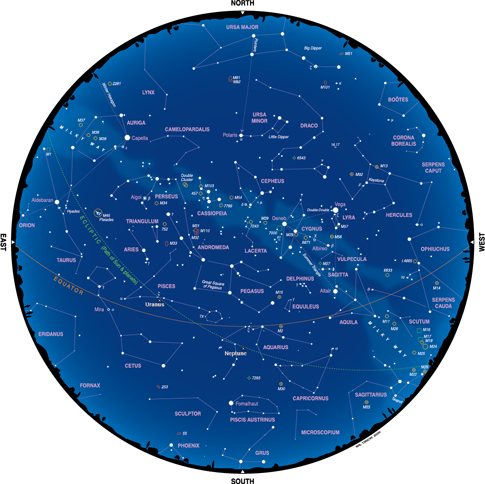 Learn the night sky – Many aids are around to help with learning the patterns of the constellations. The needs for this skill are several, but the primary need is for orientation. It’s fine to look up and say, “Ok, I see the stars. What’s next?” The answer to that is that there are many different types of objects to study besides the stars. In our own backyard is the whole of our solar system, and that is perhaps the best place to begin the journey. Knowing the constellations will help in finding the planets, as their locations are often given in reference to some constellation. As a matter of fact, most of the really interesting things to observe in the night sky are usually referenced by constellations. Make it a habit to download a monthly sky chart (links are below) and use it several times a month. Telescopes – and related equipment – Most people getting interested in astronomy, sooner or later want a telescope. Even the most casual of looks at what is offered, can be overwhelming. If ever there is an area where you need to do your homework, it is here. So let’s start at the beginning. For optical viewing, you have three choices: naked eye, binoculars, and telescopes. Most amateur astronomers and stargazers use all three. If you want to see some details on the Moon or bright planets, you will most likely want a telescope. Telescopes come in two basic flavors: refractors and reflectors. Refractors use a glass lens as the main objective lens ( the big lens in the front), and reflectors use a mirror as the main objective. Both types have their places and uses, strengths and weaknesses, and worst of all, they come in just about every price range you might imagine. However, in terms of square inches of area for light gathering, reflectors give you a much bigger bang for your buck. Reflectors get very expensive very fast. Actually, price can be your friend in terms of narrowing down the field quite a bit, but let’s come back to that and look at the recommended type for beginners first. The best all-around telescope to start with is a reflector. It works really well on the widest variety of objects to look at. Here’s the first rule about any telescope: It is always about the scope’s ability to collect light. It is not about magnification power. Bigger objectives collect more light than smaller objectives. Mirrors are better at this because large glass objectives lens are impractical. One of the most popular types of reflectors is the Newtonian, invented by and named after Sir Isaak Newton. Rule two: stay away from department store telescopes! They are cheaply made and have horrible optics. For just about the same price, you can buy a decent starter scope. Rule 3: go for the biggest mirror size you can afford; it’s that simple. Some words about refractor telescopes – If your main interest in viewing is going to be the Moon and bright planets, a larger refractor, 4 to 5 inches, can give better details using a high power eyepiece, say around 5 or 6 mm. The truth is that when it comes to deep space objects, they are dim, and you need every photon you can collect. Even reflectors around the 5 to 6 inch size are not going to be adequate for seeing much beyond a smudge or fuzzy patch. If at some point you are going to want to do astrophotography, you will need at least an 8 inch telescope with a clock drive. It is possible to do some limited photography with smaller scopes, and some experts achieve remarkable results. But let’s leave that topic for another time. A good place to compare prices and brands is to go to Amazon.com. The three major brands in no particular order are Celestron, Meade, and Orion. All three offer scopes from a few tens of dollars to many thousands of dollars. Remember though, bigger is better when it comes to light gathering ability. My budget is very limited, so I opted for Meade’s Polaris 130 reflector. From Amazon, it cost about $180, including shipping, if you have a Prime account. The 130 is a 5.1 inch mirror and comes with three eyepieces that are good enough to get you started. Please keep in mind that some people spend $600 and more just for their eyepieces, so this scope is only one or two notches above a department store scope. If you can afford more, then the next price range to look in is the $500 to $800 range. After that, it is $2500 to $5000 or more. Certainly some of the price has to do with the quality of construction, but the serious money is in the optics. My Polaris 130 is an entry-level scope, but its best can be brought out by using quality eyepieces. If I had the money, I would have started with an 8 inch Meade. Nevertheless, I am having a great time with my Polaris 130 and a set of Meade 4000 series Plossl eyepieces. Reference Material – It’s pretty hard to do any serious viewing without knowing where to look for some good stuff. The smaller telescopes are well suited for looking at the bright planets and the Moon, and I never tire of looking at the Moon. If you will look at my Books page on this site, you will see some recommendations. At the very least, I’d start with the “Total Skywatcher’s Manual,” “Night Watch,” and Sky and Telescope’s laminated Map of the Moon (unless you are not interested in the Moon). The Internet is a great resource; just search on the word “astronomy” and you’ll find enough stuff to keep you occupied for years. If you want to learn a little more about the Cosmos, look for a good, fairly recent, college text on astronomy. From my book page, I highly recommend “Exploration of the Universe.” A good place to view current documentaries on space and the cosmos is YouTube. Just search on the word “astronomy” and you will see many offerings. One in particular is a person who gathered up over 300 documentaries. Many of these are very recent and give a great overview in lay terms of what’s going on in the Universe. As you can see from above, I prefer books. However, I use the Internet continuously for astronomy, and I am adding websites to my bookmarks on a daily basis. Some of those links I have put on the Links page on this site, but let’s get specific. I download and print the two-page chart. The first page is the actual sky chart and the second page is a reference to neat stuff visible during the month. Both this chart and the one below are great for learning the night sky. This chart comes from the Orion Telescope site, and it is downloadable and printable in black and white, which I highly recommend. EarthSky – For just about anything having to do with the Cosmos, you will find the news on this site. I signed up for a daily news letter. It contains links to all of the important information. Sky and Telescope – This is the monthly magazine, but you do not have to subscribe to it to use the site’s resources. Astronomy – Like Sky and Telescope, you do not have to subscribe to the magazine. Tip: While drinking your morning coffee, just type the word “astronomy” in a Google search textbox and cruise through the bazillions of hits returned by its search engine. Online – As I plow my way through the litany of astronomical information, questions arise. The following website has very active forums for just about any topic. http://www.cloudynights.com. Also, there are two long-running magazines that have all kinds of free resources on their sites: Sky and Telescope and Astronomy. And lastly, the Orion Telescope site has one of the best printable monthly skycharts around, and it’s free. What’s next? – Well, if you have accomplished all the stuff on this page, congratulations, you are no longer a beginner. Where you go from here is going to depend upon your particular interests. No doubt you will continue to gather resources and study them. You might want to visit the Basics page on this site for an explanation of various objects in the Universe. A good tip is to spend time with seasoned amateurs; ask a lot of questions; take some courses; and most of all, spend as much time as you can exploring the night sky! Most importantly – Have a lot of fun!